Hello again! It’s Alicia from The Baker Upstairs, and I have another awesome recipe to share with you. 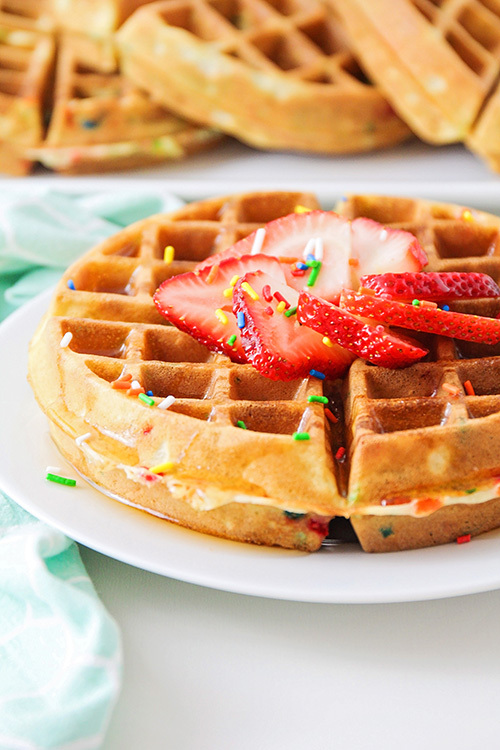 These cake batter waffles are so fun, and totally delicious too. 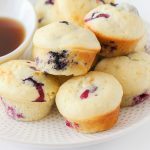 They’re the perfect special occasion breakfast! We’re smack dab in the middle of birthday season at my house right now! Everyone in my immediate family has a birthday within the same 2 1/2 month period, which means that we just seem to spend the whole spring celebrating. It’s kind of weird to binge on birthday cake and ice cream for a couple of months, and then have no birthdays for the rest of the year, but we roll with it. One of my family’s birthday traditions is that we get up early and work together to make a special birthday breakfast for the birthday girl or boy, and then we all wake the person up by playing “Birthday” by The Beatles to them. It’s fun and silly and we all look forward to it! The most recent birthday in our family was for my eight year old Lizzy, a few weeks ago. For several years I’ve been making these delicious funfetti birthday cake pancakes for her birthday breakfast, but this year she informed me that she ONLY likes waffles. She stressed that she still wanted sprinkles, but only wanted to eat them in waffle form. 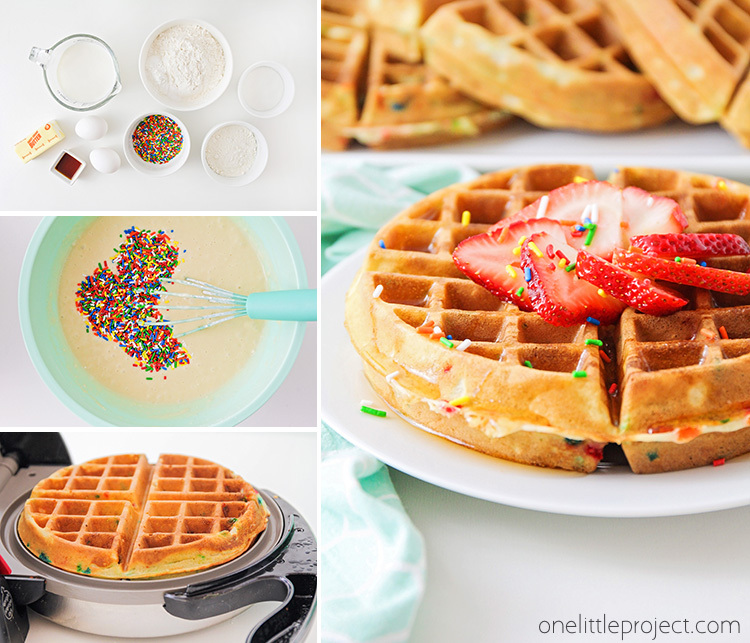 So I came up with this delicious recipe for cake batter waffles, and they were a total hit! 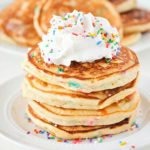 They taste just as delicious as the funfetti pancakes, but they’ve got those crisp waffle edges that I love so much! At Lizzy’s request, I made them again this weekend, just for fun, and they were every bit as delicious as we remembered. 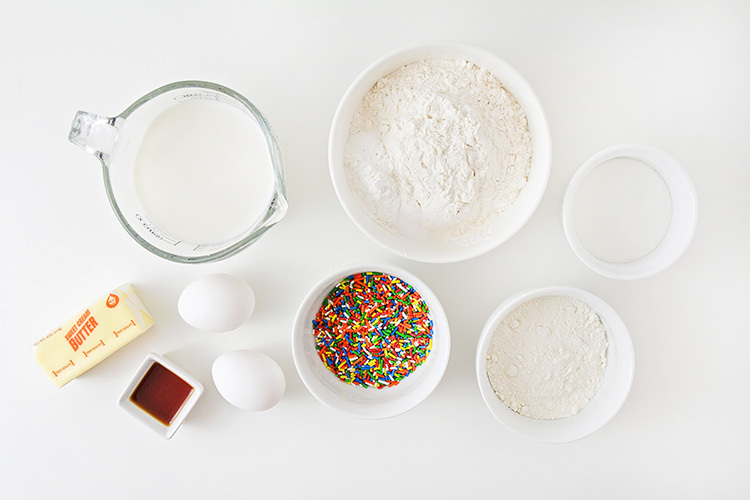 I adapted these cake batter waffles from my favorite, never-fail waffle recipe, but added some cake mix for flavor and some sprinkles to make them colorful and fun. 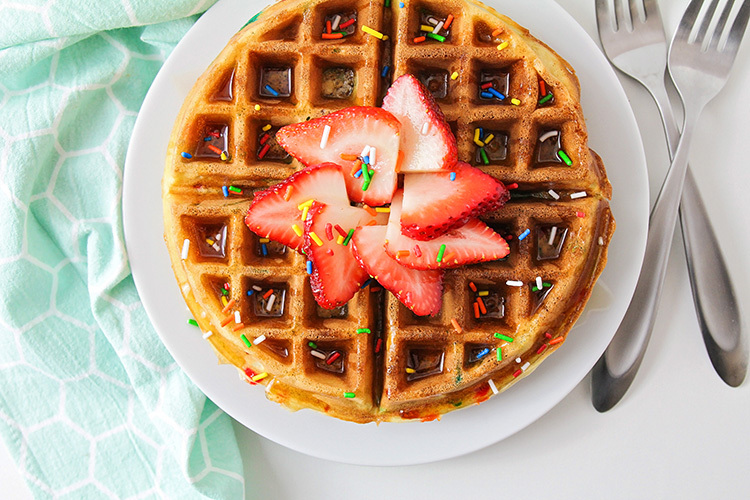 These waffles are so easy to make, and they’re sure to brighten up any morning! One of the things that I love about this recipe is that it uses just one bowl! 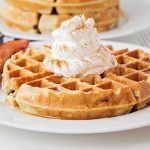 These waffles are so easy and simple to make. 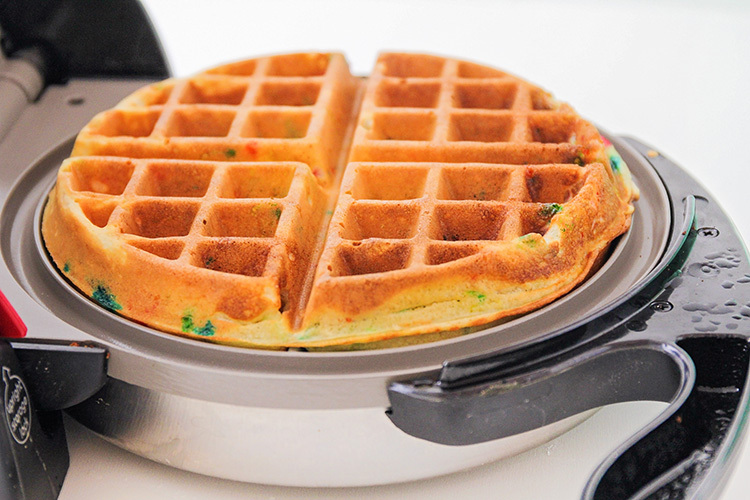 Just whisk together the ingredients, then let the batter sit for 5-10 minutes while your waffle iron heats up. 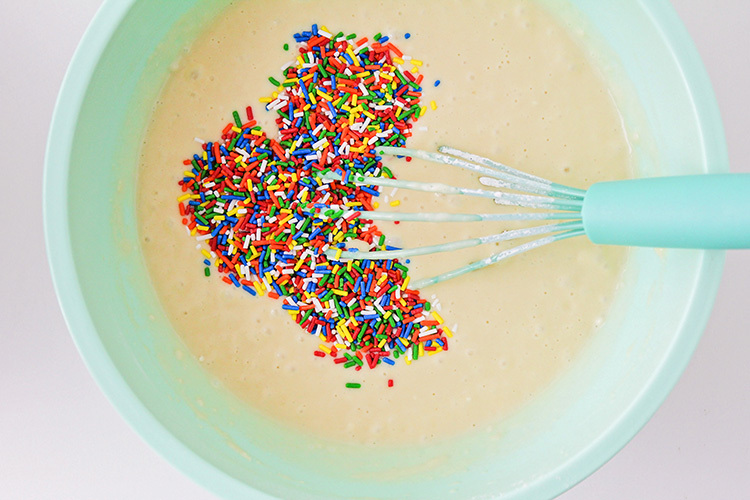 I like to wait until the last second to add the sprinkles, so the colors don’t bleed into the batter and make it discolored. Pour the batter into your waffle iron, and cook according to the waffle maker’s directions. For my own waffle maker, 1 cup of batter cooked for four minutes is perfect. The waffles come out of the waffle iron crisp and perfect and golden brown. Yum! My absolute favorite way to eat these waffles is with a dollop of whipped cream, some fresh strawberries, and a little maple syrup drizzled over the top. I was definitely planning to top these waffles with whipped cream, but I opened the fridge to find that my kids had left behind the empty can after spraying all the whipped cream into their mouths. (Little turkeys!) Luckily, these waffles taste great with or without it! These waffles are definitely best when they’re hot off the waffle iron. To keep them crisp while I’m waiting for the other waffles to cook, I like to move them from the waffle iron to a cooling rack to let air circulate and prevent sogginess. I have found that they’re pretty good the next day if stored in the fridge overnight, then reheated in the toaster oven to crisp them up again. These cake batter waffles are so light and fluffy on the inside, and crisp on the outside. They have just the perfect amount of sweetness, and a totally delicious cake batter flavor. They are breakfast perfection! Add the butter and milk to a small bowl or measuring cup, and heat in the microwave for one minute and thirty seconds, or until the butter is melted. Whisk in the vanilla and set aside. In a large bowl, beat the eggs until fluffy. Add the milk mixture and stir to combine. Add the flour, cake mix, baking powder, salt, and sugar, and mix until just combined (small lumps are ok). Let sit five minutes. While the batter is resting, preheat your waffle iron. 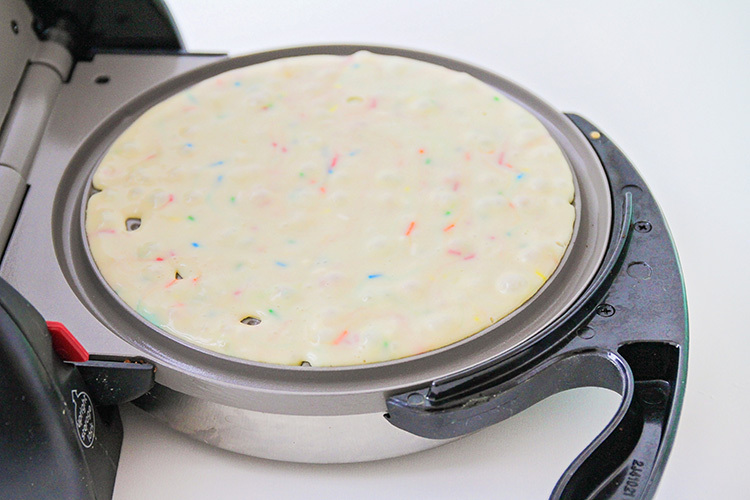 Stir in the sprinkles, then add the batter and cook according to your waffle maker's directions. For my belgian waffle maker, 1 cup of batter cooked for 4 minutes was perfect. 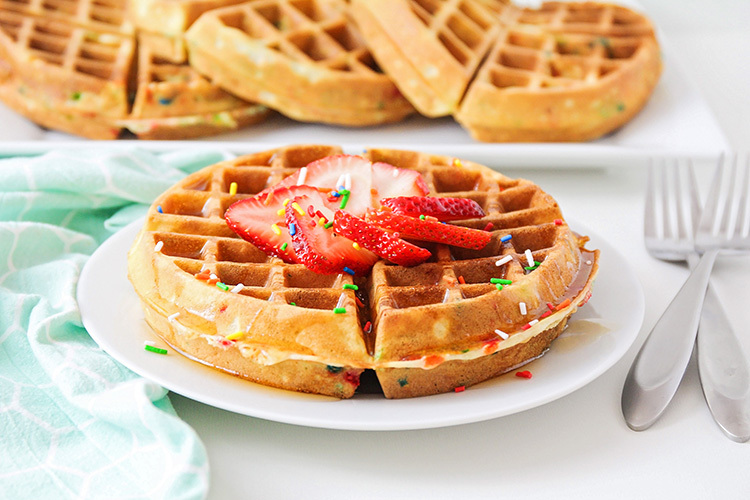 These cake batter waffles taste just like birthday cake, but in waffle form! 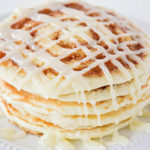 They’re perfect for birthdays, or just any time you need a special breakfast!